when I try to fill in any zone moisture it just showing “Adjusting”. Looks like it is frozen. No result from this action. Same for Empty button. I had this same problem. I totally stopped the web app, got our of it, restarted it, and my fill was showing. If you are using the web app, try using the phone app, or vice verse. You could also using the old flex web app https://flex-app.rach.io. My guess is that one of these methods will work until they have time to get the interface fixed. 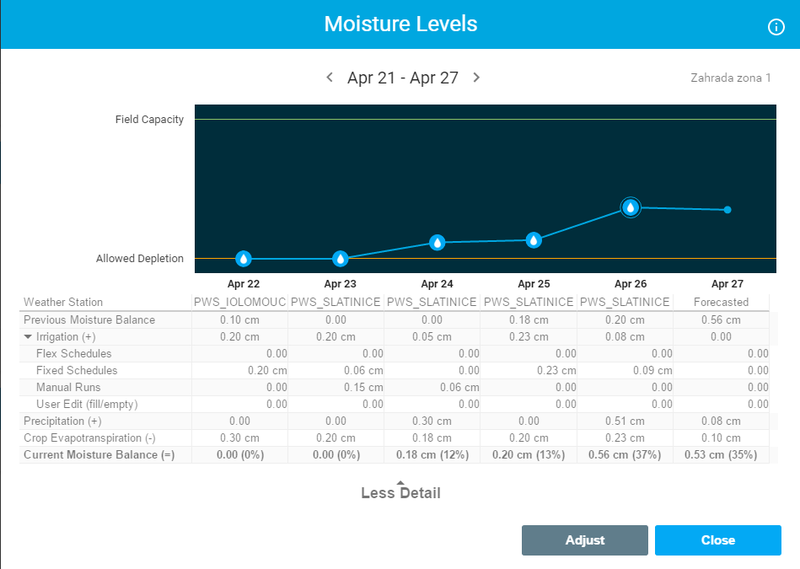 Hi, I can see moisture level only on https://flex-app.rach.io. In Android App and new web site it is not possible to adjust it. I tried different web browsers but with no luck to adjust it. Yea I think iOS and web app are the only routes. But logging out and logging back in doesn’t fix it? All three clients (iOS/Android/Webapp) should be working properly. None of those parts of the app have changed with our latest release (make sure you are on the latest version of Android/iOS). We can only adjust watering fill or empty for the previous day, since today is dynamic. Note that on the first day of your install there is no previous day, so it might seem like the fill/empty is not working correctly. If you are seeing one of the clients not working properly shoot me a PM. Hey @franz, just to be clear - is the result below intended? This morning, April 27, I clicked empty on one my zones. We can only adjust watering fill or empty for the previous day, since today is dynamic. Ok, so that’s why the empty registered for yesterday, April 26. But then why does it show a watering today? I’m well past the 3AM est start time for my flex schedule yet it said it watered today (which it didn’t) and won’t water again until April 29. Will this correct itself at some point today so it waters tomorrow morning? That would be the expected outcome of clicking empty today. Hello, FILL or Empty button stops on Adjusting. So it doesn’t work for me. Currently I have just fixed schedules because I have new lawn with grass seeds. Is it required to have Flex schedules in past to adjust it? 4:30 pm EST and the Moisture graph still shows a flex watering occurred today after clicking empty this morning (which it didn’t). Will this correct itself by 3 AM tomorrow morning so a watering will occur? But you didn’t have a schedule that ran? Oh wait. I confused myself, so the .38 is forecasted, at 3 am actual values will be applied and if it is 0 it will be reflected. In an attempt to head off a follow up question. It is possible that rachio recognizes that .38 because it did occur at the station, but not at your house. No, no schedule ran today. Not sure what the deal is… I had tried Empty once prior to the 2.5 release and it worked as expected and watered the next day. More importantly, the schedule adjusted and told me it was going to water the next day. The second box you highlighted is forecast, not application. I may be missing something, but it all looks good to me and fully expected…if you don’t feel comfortable, help me better understand your concern. Roger that, really need the watering tomorrow so hopefully it kicks off. If that’s the way it works, so be it. I was just confused when it didn’t update the schedule. Will hopefully report back tomorrow that I was just being impatient. Just for clarity, my concern is I emptied the zones this morning and A) it forecasted a watering for today that never happened and B) all day the schedule has reported the next watering will be 2 days from now instead of tomorrow morning, when it should be. Hopefully, I wake up in the AM and all is well. The watering didn’t happen, because there was forecasted rain. So flex skips. Because of this prediction, flex thinks it will run in 2 days assuming the predicted precipitation manifests. If it doesn’t, flex should kick off tonight. Oh I hear ya, it’s hard to let go to the robotic overlords. Just keep in mind that their data feeds are not real time for every weatherstation so you will see delays at times. Sometimes it might rain and they still water because the weatherstation went off line entirely. That’s why I have an external rain sensor with an ifttt recipe to impose a 24 rain delay if it trips. This way rachio can cathup via general observation. I appreciate the dialog. You clearly know the system behavior better than me, respect. 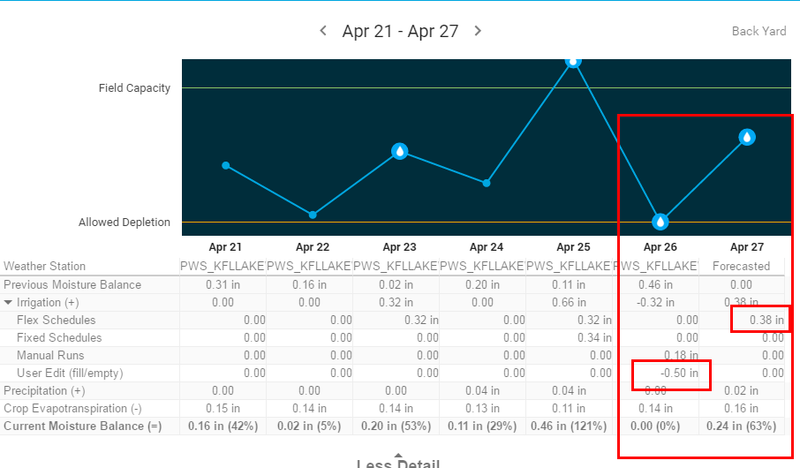 But skipping a watering when only 0.02 inches of rain is forecast and the moisture balance is zero is suspect. Even more confusing is forecasting a watering for today that will never happen because the zone was emptied after the schedule would have kicked off at 3AM today. 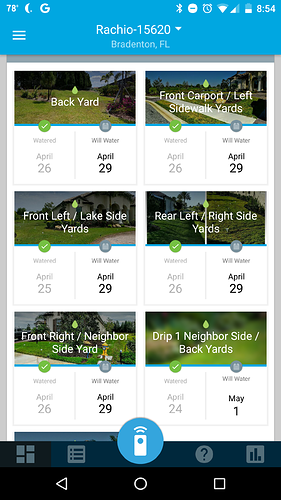 If the watering kicks off tomorrow AM, instead of Apr 29 like the app is telling me now, then this is just a sequencing/presentation/ux issue and not a bug. Will know in the AM. But if it ran and you got more rain than expected, you technically just through money down the drain. I hear ya, it’s hard to let go to the robotic overlords.